The left and bottom axes are showing the loadings; the top and right axes are showing principal component scores. The left and bottom axes are showing [normalized] principal component scores; the top and right axes are showing the loadings. I want to be sure I really get this. Now lets look at the red arrow of xvalues. Its tip is around 0.25 in the x-axis of the loadings. But according to the loadings I have just writen, it should be around 0.72. What am I missing? Finally, lets look at the point 1. According to the axes, that is telling me the principal component score. Is it that the coordinate in the new frame of reference? It doesn't make sense to me because I think that the new origin of the axes is around the point (15,15) in the Plot 3. If I look at that (and I guess that I am completely wrong here), the point one should have a coordinate around -20 or so, and not 40. Where is my mistake? Here it can be seen that the first point has the coordinate that I thought it had to have. But, still, what are the units in the biplot then?? 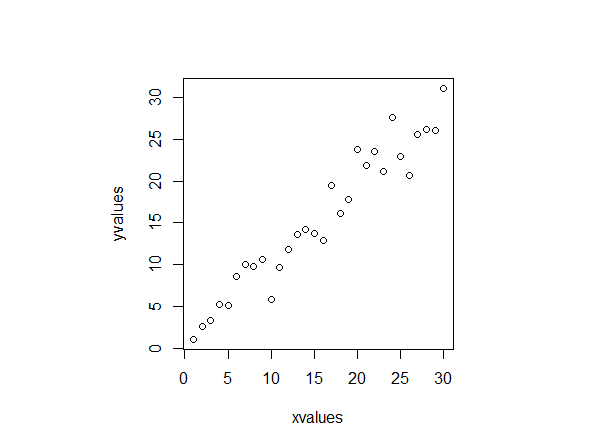 I redid your PCA in SPSS (I'm not R user). It was PCA based on covariances. I confirm your analysis. 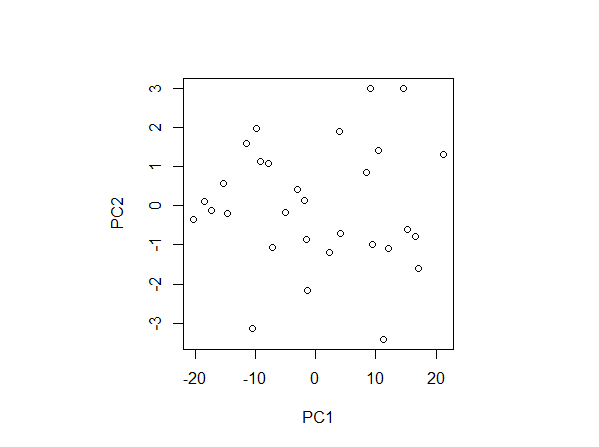 The component scores that you plotted as plot(pca_results$x) are these raw component scores printed above. The component scores on your biplot are these scores scaled to sum-of-squares=1 (sum of squares in each of the 2 columns was brought to 1). As for the loadings shown as red arrows on the biplot, they are, without doubt, rescaled loadings that I printed above. However - since I'm not R user - I can't tell you how exactly they were rescaled. But I suppose they linearly are related to the true loadings I printed. Biplots can be drawn in multiple ways, with various normalizations. I can't know how your R function exactly does it, and probably it is not too important to know it. Another my example, even more full, is here. It is the outputs of PCA and LDA (linear discriminant) analyses of iris data. Not the answer you're looking for? Browse other questions tagged r pca interpretation biplot or ask your own question. 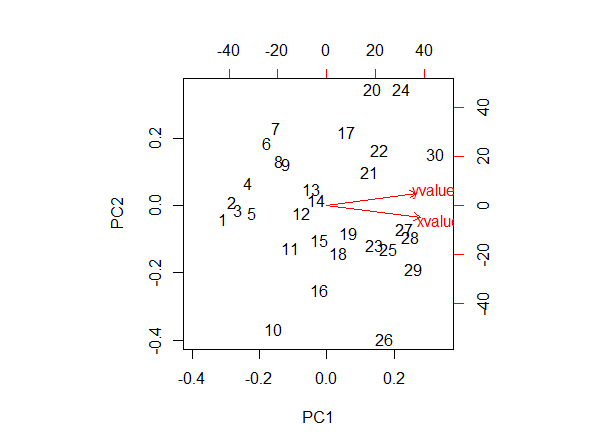 What are the four axes on PCA biplot? Should one remove highly correlated variables before doing PCA? Which variables explain which PCA components, and vice versa?